Correction from a previous post in which I said that the finished postage stamp quilt would have 4,791 pieces. In fact, it’s ‘only’ 4,761! And, it’s all done! This quilt has been in the works since last Christmas and has been a fun thing to pick up and work at in between other projects. There are 16 blocks of 16 x 16, or 256 1″ squares. The pieces were drawn randomly from a large bin. If I grabbed two that were the same I swapped one out, but otherwise there is no pattern. I joined the pieces in twos, then made those twos into fours. Next, I took four of the fours and made them into a block. These blocks were trimmed to 4 1/2″ square. Usually I set out to make eight of these squares in one setting. When I had 16 of them I made them into the 16 x 16 block. The iron was busy throughout; there are so many seams! It took some experimenting to find the best pressing pattern. For instance, all of the four piece strips are pressed to one side and then they nest well when joined. In places where there is a lot of bulk the seams are pressed open. Here’s a photo of a section of the back of the quilt. It looks crazy, but there was a method! The sashing is more of the 1″ pieces, all cream with text. Once the sashing was on I felt that it needed a border so added a narrow strip of Moda Grunge in grey. This quilt has enough going on, on the feature side, that I felt the back should be pretty calm. 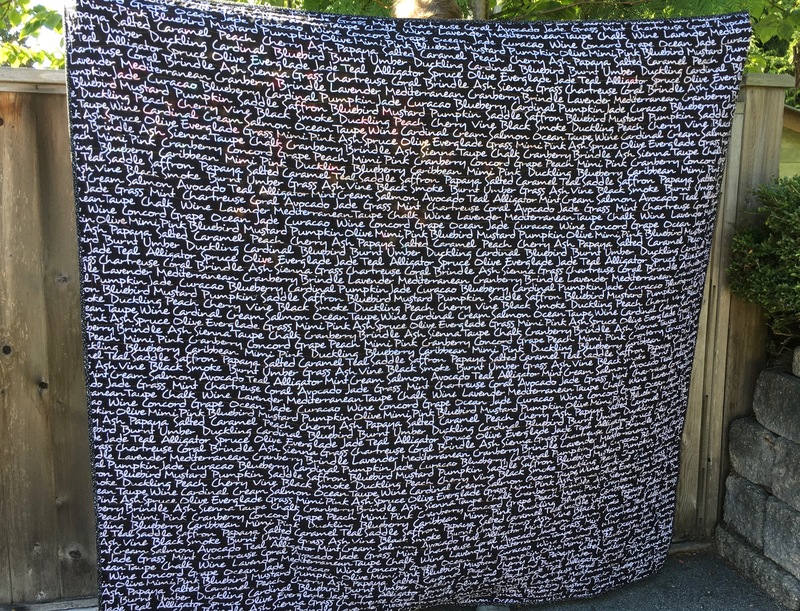 At The Red Barn in Courtenay I found an extra-wide black fabric that has the names of colours written in white. As it was extra-wide I didn’t need to piece it and I thought the colour names fit perfectly. I used Superior King Tut thread, in gold, red, orange and grey for the quilting and did a series of wavy lines that run from side to side over the small pieces. The border is quilted separately with five narrow lines, using the same thread colours. The binding is a black cotton with white dots of various sizes. It was attached by machine and finished by hand. The label went on and then the quilt went through the washer and dryer. I’ve been using Forever New detergent for my quilts and love the way it makes them feel and smell. This was a very fun project and I’m thrilled with the end result. It’s just a riot of colour! Here are front and back pictures of 4761. Click on the picture to enlarge. 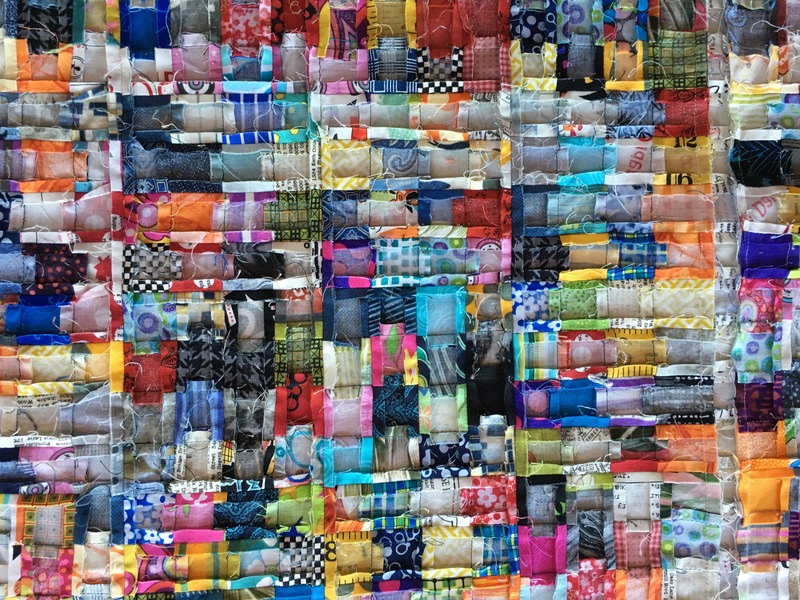 This entry was posted in Quilts - Their Stories and tagged finish, i spy quilt, own-design, postage stamp quilt on September 25, 2016 by Megan Hanna. Here we are, three days into September. It’s cooler out and dark at 6 AM; almost like someone flipped a switch to turn summer off. Fall officially starts on Thursday, September 22 at 7:21 AM PDT. But, in so many ways, I’ve mentally made the jump and I’ll look back at summer 2016 with fond memories. We hung out with family and friends. We made short trips to Victoria, Penticton and Calgary and enjoyed three wonderful months on Denman Island. Old chores that have been put off for too long got tackled and I finished several projects that had been starting to weigh on my mind. Our home on Denman Island is built on a piece of property that was once rented to a stained glass artist. For some reason, and I honestly can’t think what it would be, he disposed of piles of leftover glass bits in the yard. When it came time for us to build, we unearthed this glass and I gathered up a small box full. I’ve saved it for 8+ years, wanting to use if for something. 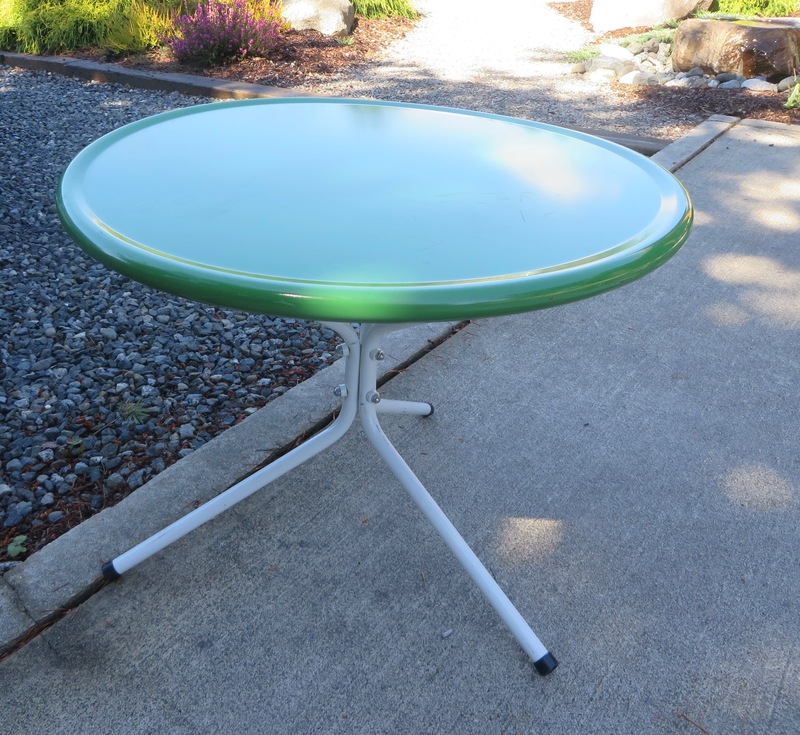 I found the perfect table for my project at a garage sale in Victoria for $4. I painted the table, using Annie Sloan Chalk Paint. 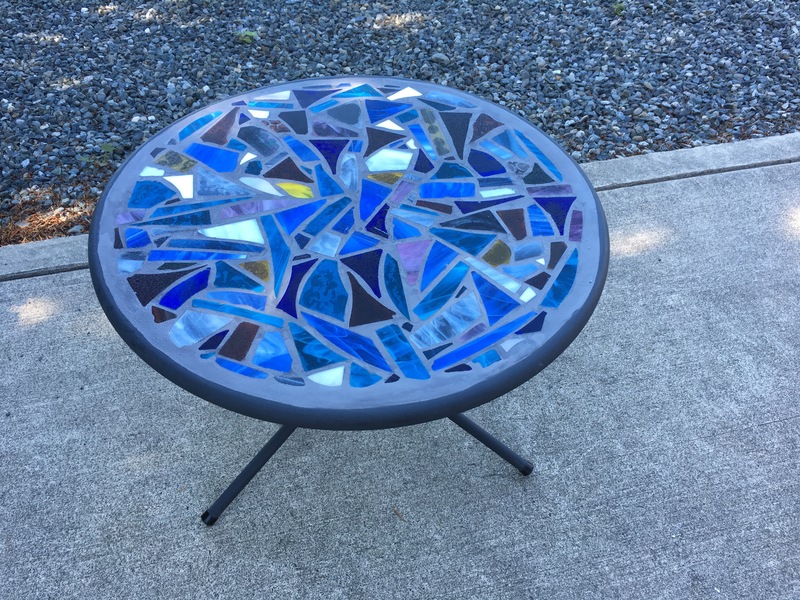 https://www.anniesloan.com Then, using mosaic glue, I stuck the glass bits to the table top. Blake took over with the grouting, making a nice flat surface. It’s been sealed and is good to be used indoors or outdoors. Here are before and after shots. Two years ago our neighbours sold their home on Denman Island. 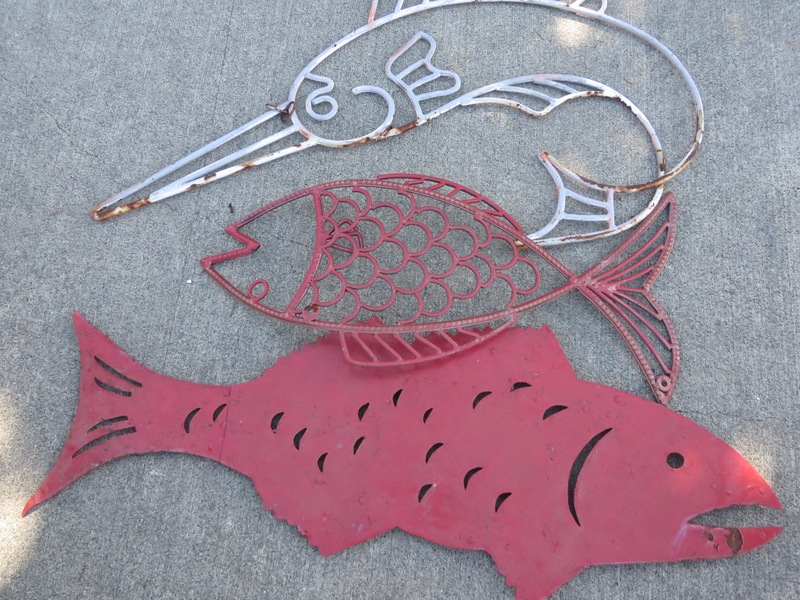 The new owner inherited three metal fish and was going to send them to the trash. I asked if we could rescue them and she was thrilled. Again, using the Annie Sloan paint, I fixed them up and have attached them to a retaining wall. They don’t all fit into one picture, but here’s an idea. Other victories include finishing a pair of socks, a scarf and a rag rug, (6 years later!). The postage stamp quilt that I’ve been working on since January has been quilted and I’ve just started to hand sew the binding. Yesterday I competed in a sprint distance triathlon as part of the Americas Masters Games. A sprint triathlon comprises a 750 metre swim (ocean), a 20 km bike and a 5 km run. It’s been more than four years since I’ve raced and I was both nervous and excited. The night before, the weather was terrible with torrential rain and high wind. Swimming and running in bad weather don’t bother me at all, but cycling is another story. Thankfully, conditions during the race were ok and I was pretty happy with my finishing time. (I missed the podium by 10 seconds and have replayed that many times as it was firmly in my grasp. I’ll have to work on my killer instinct!!) I realized how much I enjoy triathlon and the challenge and variety of training for three sports. Such fun and a perfect way to cap off the summer. Today I’m feeling a bit lost. We’ve settled back into city life, my projects are all done, the big Modern Quilt Showcase is over and I’ve completed the race that I’ve been training for all summer. It’s a good time to sit back and take stock of what I’d like to work on and achieve in the next few months. I hope your summer memories are special and I wish you a pleasant Labour Day Weekend, wherever you are! 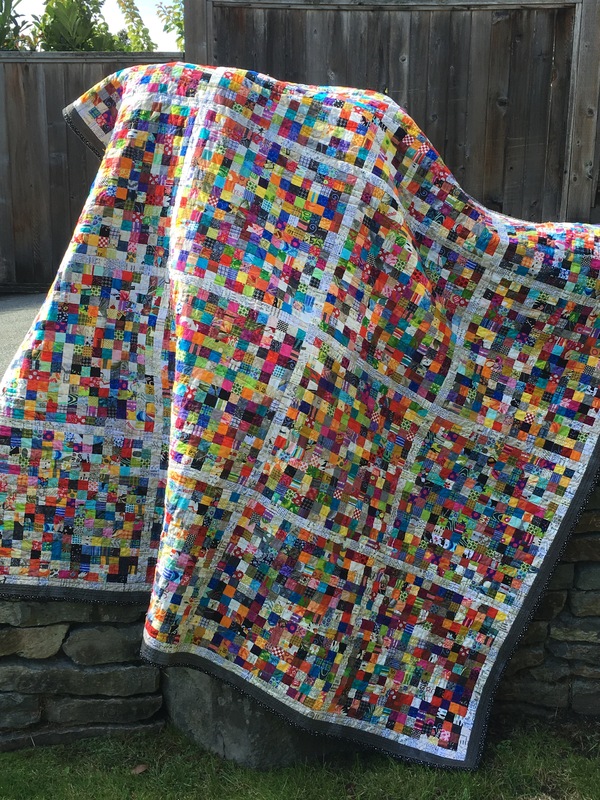 This entry was posted in Uncategorized and tagged denman island, finish, postage stamp quilt, run, training, triathlon on September 3, 2016 by Megan Hanna. It’s not really Christmas, although the summer weather has been a bit chilly this month. We’ve seen single digits, lots of rain and some high winds. Today is a perfect day for the 5th annual ‘Ewe da Best’ golf tournament, which is held on a local sheep pasture. Last summer I participated in my first webinar, called ‘Wedge Quilts Go Modern’. It was put on by the Modern Quilt Guild and the instructor was Christina Cameli. Christina showed us how to use a wedge-shaped ruler to cut strips of fabric. Yes, it could be done without this tool, but it would be more difficult and I don’t think the results would be as accurate. We learned how to join the strips and ways to work with the hole created in the centre of the strips. (In my quilt the white circles fill in that hole. )The webinar also covered making pieced strips, fractured strips and negative space strips. Webinars are a terrific way to learn a new skill, without having to leave home. You could even be in pj’s having a glass of wine! Here are some wedge rulers. Without an end in mind, I made the three circles last fall. Then they sat. After a couple of months I added them to a white background. They are appliquéd on using the blanket stitch on my machine. At the same time, I made the backing, using bits and pieces of reds, greens and whites. I squared up the top and the backing and then put them away until May. This is the second quilt that I’ve done this way and it seems that taking a break from them makes them exciting again. I made a quilt sandwich with the top, the backing and bamboo for the batting, but wasn’t sure how to quilt it. In the end, I started with the three circles and did a pebble pattern in each of the coloured spokes using Superior King Tut thread in White Linen. The white spokes are not quilted so they puff out a bit. The grid pattern is random and I used the same thread in Limestone, White Linen, Cheery Red and Holly and Ivy. The binding is a great fabric that I stumbled on in Fabricland. It doesn’t show well in the photos, but it’s Christmas candies in all of the colours that are in the quilt. The finished quilt is approximately 60″ x 60″, perfect to curl up with on Christmas morning. While I love it, I am going to put it up for sale in the Denman Island Studio Tour August 6 and 7. Here are some photos; you can click on them to enlarge and see captions. Close up of pebble stitch quilting and blanket stitch appliqué. HO! HO! HO! and thanks for reading. This entry was posted in Quilts - Their Stories and tagged finish, free motion quilting, own-design, thread on July 21, 2016 by Megan Hanna. I like it when things are in their place. I’m not obsessive about this, but when things are where they should be there’s a sense of calm in my world. Recently, in the book shops, I’ve picked up a book called the life-changing magic of tidying up: the japanese art of decluttering and organizing. It’s a pretty book and a nice size too. It’s a New York Times #1 best seller, written by Marie Kondo. So, why don’t I buy the book and find out what the magic is? Mainly because it seems to me that it would just add One More Thing that I’d need to declutter. Three weeks ago I had some dental surgery done, and was instructed/ordered not to exercise for a week. That week ended up being almost two weeks and then, just when I thought it was OK to get out there, I got a nasty cold. Minor stuff, but I listened to my body and just hung about. The benefit of this little break was having lots of time to clean up my sewing room and finish some niggly bits and pieces. I got down to the bottom of my ironing bucket. I finally sewed a hanging loop on my jean jacket. Honestly, it took less than five minutes and I’ve put it off for two years! I sorted fabrics that are leftover from three different quilts. I put aside fabric and notions that will be donated or swapped. I put hanging sleeves on my wall quilts so that they can actually hang and not spend their days in a pile on the floor. Everything is labelled now. This quilt, which was started over two years ago, was promised to Project Linus. It will be my second donation to them. Their donated quilts and blankets go to a transition house in North Vancouver. It’s free motion quilted with different patterns on each block and then a meander on all the white. I hope that it brings comfort and joy to someone. There is one more UFO, (unfinished object), waiting to be quilted and I’ve just ordered some thread for it. I’m sticking to my goal of not buying any new fabric as my collection is full of wonderful pieces that are calling to be used. And, this afternoon I began working on a lined linen blazer. That fabric’s been around for a while, but linen is timeless, right!? Yesterday marked five weeks until my Half Ironman race. I’m definitely not where I’d like to be as far as training distances. Three weeks off, at this point, isn’t recommended, but I had a good solid base and should be able to build up the mileage. My mind and my sewing room have been decluttered. Order has been restored and I can get excited again about new projects and spending time in the water, on the bike and on the road. This entry was posted in Quilts - Their Stories and tagged finish, free motion quilting, training, triathlon, UFO on May 10, 2016 by Megan Hanna. Creative Threads Conspiracy is a three-day event that happens on Denman Island every October. The website for 2016 isn’t up yet, but if you’d like an idea of what goes on, you can click on this link, Creative Threads Conspiracy , from 2015. I’ve taken part for the past two years and eagerly await the schedule for this year. This past October I joined two workshops; Collaborative Quilts and Coptic Bookbinding. Each workshop was a full day, lead by knowledgeable instructors. For the quilt workshop we were to bring a box containing roughly 4 yards of fabric. The fabric could be small bits, scraps and larger pieces, but they needed to work together. I went with one of my favourite combinations of red, black, white, yellow and grey, with a few bits of text fabric thrown in. I also had a 3″ x 3″ square of Linus, from the Peanuts cartoon. There were 11, (12??) in the class. We each started with our own fabric box and had 20 minutes to do the first block. Then, every 20 minutes, the boxes and quilt tops were moved to a different person, who added her own touch and a surprise piece of fabric. As the quilt tops got larger it became difficult to formulate an idea, cut it out and get it stitched on before the bell rang. At the end of the day we took our pieces out into the sunshine and had show and tell. 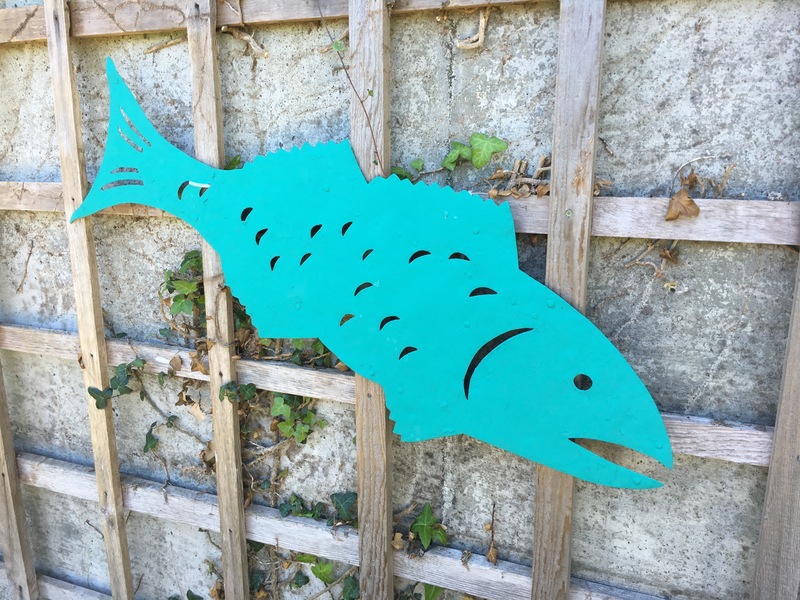 The pieces were approximately 24″ x 30″, perhaps a bit larger and all were very creative. Each person respected the work that had already been done and carried on the theme. My piece got put into a box and tucked away. Yes, it became a UFO, or UnFinished Object. I had a few other things that I wanted to get done. And there was Christmas, a trip to Hawaii, my Mom’s 90th birthday and, well, life in general. Recently, I decided it was time to get this project finished and pulled the box out. Having let it sit for almost three months seemed to breathe new life into it. Where I hadn’t been in love with it, I saw possibility. I did need to reposition and trim a wee bit in order to straighten it and make it a reasonable size. I used some scraps for the backing and bound it with a black background/white dot fabric. There’s also a small insert of text fabric in the binding. The binding is attached front and back by machine. A machine-made label sewn on to the back completed this project. Oh, I forgot that I added five buttons for sparkle. And, the best part, is the little insert along the bottom row that says ‘being partial to chickens roasted’. Isn’t that just random and so much fun?! It turns out that I love this little hanging as it makes me think of a great weekend of learning, sharing and working together. I hope it brings a smile to your face as well. This entry was posted in Quilts - Their Stories and tagged creative threads conspiracy, finish, hanging, UFO on February 21, 2016 by Megan Hanna.